Also called a piano hinge. All continuous hinges rotate 270 degrees, measure 6' in length and come with no holes, making it easy to either weld or drill to specification. Call 800-298-8924 to order Polar Hardware enclosed trailer parts part number SH200 or order online at etrailer.com. Free expert support on all Polar Hardware products. Guaranteed Lowest Price and Fastest Shipping for 2" Wide Continuous Stainless Steel Hinge, 6' Long. Enclosed Trailer Parts reviews from real customers. Also called a piano hinge. All continuous hinges rotate 270 degrees, measure 6' in length and come with no holes, making it easy to either weld or drill to specification. Redline Locking "L" Style Door Handle - 2-1/2"
Today, we're going to be taking a look at the two-inch wide continuous stainless steel hinge that measure six feet long. This is also called a piano hinge. These types of hinges are used for a variety of applications. You'll find them on toolboxes, different types of flaps. They're commonly used for trailer ramp doors. This one, in particular, is going to be constructed of a stainless steel construction. Very strong and durable design. Stainless steel also does a great job at resisting rust and corrosion, so it's going to last a long time. It does rotate two-hundred and seventy degrees. It's got nice, easy, smooth operation. As you'll notice, it does not feature any pre-drilled holes. That makes it easier for welding applications. What that also does, is it makes it easier to customize this for the fit that you need for your application. You can drill holes along it, where you need it. That way it can fit your needs as best as possible. The only other thing about these hinges, is they can be cut to length. If you don't need all of six feet, if you only need two feet, measure two from the end. Pick the area between the knuckles, where you can cut and make that cut. It's just a really nice design. The flat width. Right now, I have it flat on the table. If we measure from edge to edge of the unit, it's going to give us a width of two inches. The pin size, there's going to be an internal pin that runs all through these knuckles here. That pin's going to have a diameter of around three-sixteenths of an inch. The steel that it uses, when it comes to the gauge, that's zero-point-zero-six-zero inches. If we take an overall length measurement, going from edge to edge, it's right on seventy-two inches. Six feet long. When it comes to the knuckle length, that's going to be the length of all the knuckles right here. Each one, individually, is going to measure a half of an inch. That's going to do it for today's look at the two-inch wide continuous stainless steel hinge that measures six feet long. Order: RelevanceNewestRating - High to LowRating - Low to High Also called a piano hinge. All continuous hinges rotate 270 degrees, measure 6' in length and come with no holes, making it easy to either weld or drill to specification. The Camco Oak Accents RV Countertop Extension, # CAM43421, comes with a piano style hinge, similar to # SH200, only shorter. It also has a brace that locks into place while the extension is in the horizontal position. We do offer ramps that are 11-inches wide but the length is quite a lot longer than the 58-inches you said your ramp is. I recommend a ramp like part # EM07464-2. these ramps fold and are 80-inches long and 11-inches wide. As far as the replacement hinge, I recommend a hinge like part # SH200. This is a 2-inch wide continuous hinge. The hinge is 6-ft long so you will need to cut it to the correct length you need. All of the hinges we sell like # SH150 are 6 feet long. 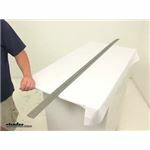 You can certainly trim a 6-foot length as needed provided you use the proper saw with a blade designed to cut metal. 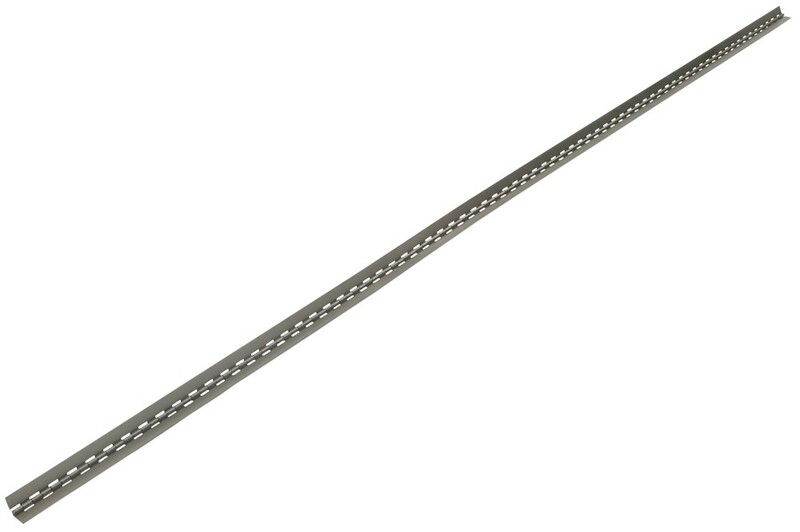 Hinge # SH150 is stainless steel, 6 feet long, and 1-1/2 inches wide. 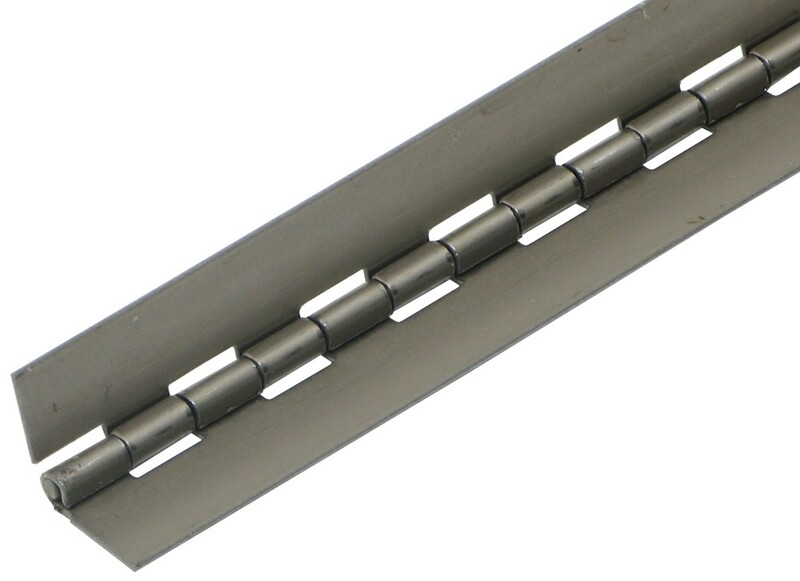 Hinge # SH200 is stainless steel, 6 feet long, and 2 inches wide. Hinge # SH300 is stainless steel, 6 feet long, and 3 inches wide.